WBEZ is Chicago’s Public Radio, broadcasting at 91.5 FM from Navy Pier, with a strong signal that typically finds its way through the Chicago area and into Wisconsin and Indiana. Their position as a reputable leader in Chicago media is indisputable, and their mission, to "expand our outreach to the community and enhance our production effort through partnerships and educational programs with local and national institutions" represents welcomed support for schools and non school tutor/mentor programs throughout Chicago, each fighting daily to help students and families in high-poverty neighborhoods. The series is titled Fifty-Fifty Project: The Odds Of Graduating, and is chock full of eye-opening investigative journalism, providing a glimpse into the lives of those at Robeson. I highly recommend reading the transcripts while listening to archived stories and interviews at the WBEZ City Room website. While I listen, I just can’t help but wonder why an alliance in support of the kids and schools, among concerned donors, volunteers, a media leader like WBEZ, and us here at Tutor/Mentor Connection does not already exist. 2. Concerned leaders/citizens say, "Wow – now that you’ve taken me up close and personal… I had no idea! What can we do to help?" 3. Some of these concerned listeners are associated through work or family or friends with other people who can cut checks or roll up their sleeves, but don't know where to go or what to do... they need to be pointed in the right direction before they lose focus and are consumed with more Swine Flu news. WBEZ and the media can be a liaison at this point. In fact, some might argue the media has some responsibility TO BE a liaison at this point, once they uncover issue. I understand that WBEZ’s job is primarily to investigate and report, but I hope there is a way to bridge this gap that exists between the moment listeners absorb and concern themselves with negative news... and the moment they ask, "Ok so what can I do?" I would hope media outlets at least post contact information for community leaders working to address the problems they broadcast. Occasionally it would be cool to see or hear a panel discussion among leaders (with a disclaimer perhaps that "opinions don't reflect the views of the station," if needed). 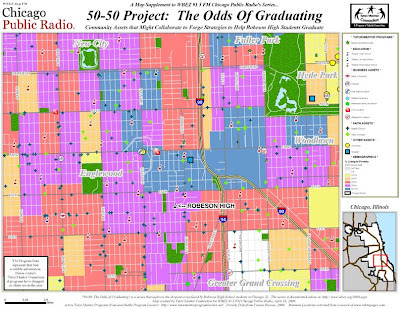 In the Fifty-Fifty Project: The Odds Of Graduating series, we meet one parent who is "raising a 17-year-old in a neighborhood where street life looms larger than school" and "relying on prayer to help her through." Volunteer mentors at a tutor/mentor program near Robeson can help this mother, if one exists... if the mother knows about it... if volunteers know about it! 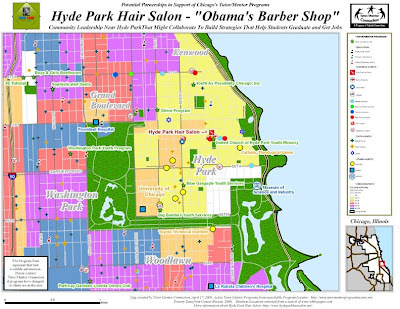 Reporter Natalie Moore reveals that "Most of the incoming freshman at Robeson High School in Chicago’s Englewood neighborhood read below grade level," and that teen pregnancy also contributes to drop outs. She reports that "Chicago Public Schools has nothing in place to address the problem. No prevention, no counseling once teens become parents. Instead it’s up to struggling neighborhood high schools like Robeson to figure out what to do." Clearly, academic tutoring can help the freshmen boost their reading skill and academic confidence... and mentoring can support better life decisions among the girls! Reporter Julia McEvoy explores how "Teenage boys can face tough choices as they advance toward manhood. But the choices Demetrius Davis is making are critical. He knows he can go the way of his two older brothers—one of them is dead and the other in jail—or he can reject street life and focus on graduating high school." She also exposes how faculty at Robeson struggles to keep kids in school and on track. Tutoring and Mentoring can help CPS help keep students on track! Linda Lutton reports that the Johnel Ford story we mapped in February represents only one of three Robeson student murders this year. She explores the violence crisis and introduces a teacher who "finds himself on the front lines of the dropout crisis, with few resources." Tutoring and Mentoring can be part of a comprehensive solution to the shortage of resources available to CPS teachers and students! It's just such a wasted opportunity if all we do is listen to this amazing journalism, shake our heads in disbelief, and then do nothing proactive to address the problem. But we need leaders. And with this in mind, I tend to think it's not enough for media leadership to simply expose problems. They can be leaders for change, while still maintaining their journalistic integrity. 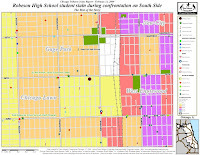 In the case of the Fifty-Fifty Project: The Odds Of Graduating, why can't WBEZ direct concerned and action-minded listeners to places like Tutor/Mentor Connection, where listeners can get involved, ultimately helping to create more and better tutor/mentor programs for students in Englewood/Robeson and elsewhere? I also call on the media to direct concerned donors, however ethically possible, to non profits like Tutor/Mentor Connection... who rely on charitable funding to survive, and to continue their important efforts. And I call on YOU to do what you can... volunteer or donate if you can... but at the very least, contact media and business leadership and direct them to resources such as my blogs and maps, or this article at the "Tutor/Mentor Institute" that explains the logical connection behind combining adult volunteer mentors and inner city youth in one-on-one partnerships to help kids stay in school, succeed academically, find jobs, and alleviate our common concerns regarding drop-outs, crime, and poverty. With media leadership, your proactive response to the negative news, and business dollars, there just might be a partnership out there that will make this work, before non profits that have the capacity for solutions run out of money, and Robeson just isn't news any more. To highlight this legislation's potential benefits for students living in high poverty urban conditions, Obama, along with former President Clinton and Senator Edward Kennedy of Massachusetts, chose to sign the bill into law on location at the SEED School in Washington D.C. R&B star Usher was even in attendance. SEED teachers beamed with pride. And rightly so. What SEED students have overcome in just over a decade is nothing short of amazing. Washington Post Reporter Hamil R. Harris recalls that the corner where the SEED School operates "used to be a perilous intersection filled with the gunfire of drug dealers roaming in old sedans." 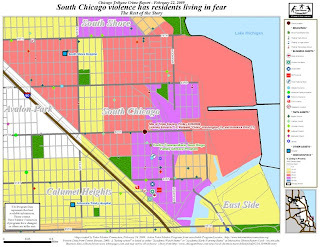 My maps (such as the one above) have explored similar high-crime neighborhoods in Chicago. Who knows how many students live in these conditions in urban settings coast to coast. Today, eleven years after SEED opened its doors, its students in the same D.C. neighborhood graduate at a whopping 98% rate. Compare that to the national average of 56%. Pretty impressive, huh? Similar to Tutor/Mentor Connection and mixed tutor/mentor programs throughout Chicago, SEED operates on a nonprofit budget, partnering with community leaders "to prepare underserved students for success in college and beyond." They do this via an ambitious "boarding program, which teaches life skills and provides a safe and secure environment." Make no mistake, this is awesome, and SEED deserves plenty of attention, accolades, and funding from donors who have been waiting to learn about a great non profit to support. But is this truly a volunteer/service-oriented setting? I wonder after perusing their website, why the government chose a single school (whose website as far as I can tell gives little indication they work with volunteers at all) to launch a service-oriented bill? Is what SEED doing important and worthy of praise? Of course. Not taking away from the great work they do. But do they need the volunteers this bill is supposed to inspire? Apart from the one reference to a staff member who is in charge of "volunteer recruitment," and with no mention of volunteering on their employment page at all, I can’t help but wonder, after the fuzzy feeling generated by this photo op dissipates, if there will be an effort by government or media to guide the new army of volunteers to tutor/mentor programs - programs that rely exclusively on "volunteer service." I'm worried this "photo op" with SEED students and Usher today will be the end of the media's attention span on the issue. I fear this will mark the beginning and end of the government's exploration of how academics plus volunteer mentoring – the very thing the money is supposed to support – combine to help students. I worry that the public will be left with a misguided perception that our tax money is helping guide new volunteers to volunteer-reliant programs across the spectrum, when in reality it might only help the high-profile nonprofits. I worry that the $5.7 billion will be picked clean before it gets anywhere near the volunteer-based tutor/mentor programs that are reaching the hundreds of thousands of students SEED cannot – in D.C. and beyond. Am I whining? Hell no... again, nothing against SEED, but I’m here to advocate on behalf of the rest of the students. I'm screaming for media and political attention to help volunteer-based tutoring and mentoring programs. Mister President, please work with the media to help us raise visibility and support for important volunteer-based tutor/mentor programs as well. Don't walk away from SEED thinking "Mission Accomplished." ... and do something to invest in sustaining and developing volunteer-based tutor/mentor programs everywhere, to help the millions of students who don't have the resources offered by a "SEED" yet. Or if you prefer, please contact Tutor/Mentor Connection or myself with questions of how to get started. You might also want to take another look at the cool NEW IMPROVED Program Locator to find a program near you. And don't forget to spend some time at the Tutor/Mentor Institute, which is chock full of resources that will help you get started forming partnerships and strategies in support of tutoring and mentoring. A New Google-based Tutor/Mentor Program Locator! The Tutor/Mentor Connection (T/MC) is excited to launch a new version of its online Tutor/Mentor Program Locator. 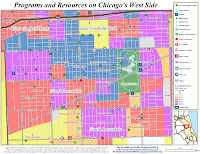 Since 1993 the T/MC has been piloting the use of a mapping technology – GIS (Geographic Information Systems) – to create tools that help build and sustain comprehensive mentoring-to-career programs in every high-poverty neighborhood in the Chicago area, while providing resources that excite volunteers, donors, and community leadership about their roles in supporting this process. In May 1994 the T/MC first published a printed Directory of volunteer-based tutoring and/or mentoring programs serving Chicago, and operating in non school hours. The Directory was sent to about 3000 business, foundations, schools, libraries each year until 2001. The T/MC began to put its strategy on the Internet in 1998, and posted the Directory in a searchable on-line Program Locator in 2004. Its web sites recorded more than 100,000 visitors and one million page views in 2008. A search of Google for "tutor mentor" brings the website up first among thousands of listings. The new Program Locator is the next logical step in this technological evolution. 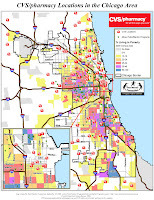 While the original Program Locator could be searched for type of program, age group served, and zip code, with the results plotted on a Google map, the new Program Locator takes advantage of Google technologies to provide interactive access to all poverty, asset, and boundary data – the same map layers used by the T/MC mapping department when we make the maps featured in stories at http://mappingforjustice.blogspot.com/ and elsewhere on the Internet. For those new to the concept of tutoring and mentoring, tutor/mentor programs are nonprofit facilities that offer one-to-one volunteer-student tutoring and mentoring services during non-school hours. The programs are vital to the success of college-minded and career-oriented students who are a little behind the curve due to inadequate school facilities and the challenges of high-poverty. Thanks to a generous donation received in November 2007, the T/MC hired me, Mike Trakan, in January 2008 to rebuild its desktop mapping capacity. If you scroll through the links on the side you can see the maps I’ve created since then, and articles that I’ve written to show people how they can use maps. 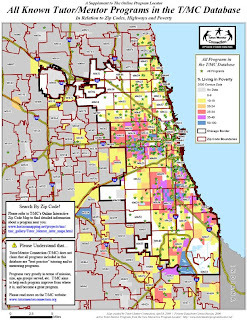 What’s special about the new Interactive Program Locator is that you are now able to create your own maps, very similar to the ones I make at the Chicago office of the Tutor/Mentor Connection. In addition to plotting program locations, the new Program Locator offers a visual Google-style representation of T/MC data, highlighting relationships among existing programs, poverty, and available community resources. With a T/MC mapping tool like the new Program Locator in hand, any community leader – from businesses, universities, hospitals, or churches for starters – can quickly zoom to a high-poverty neighborhood to see where programs are needed or missing completely. Leaders can then find geographic relationships among programs, themselves, and potential partners – and ultimately organize alliances that support existing programs or build new ones if needed. Of course, important features that were a part of the original Program Locator remain. Browse program locations to find addresses, phone numbers, contact names, hours of operation, age-group served, and website links. The new Program Locator simply offers you – the volunteers, donors, parents and youth – new depth, and an additional understanding of where support for tutor/mentor programs is most needed. How are these maps to be used? The articles I’ve written for the past year show how the maps can be used. I encourage you to read these. I also encourage you to read the articles Dan Bassill, President of the T/MC writes, at http://tutormentor.blogspot.com/. 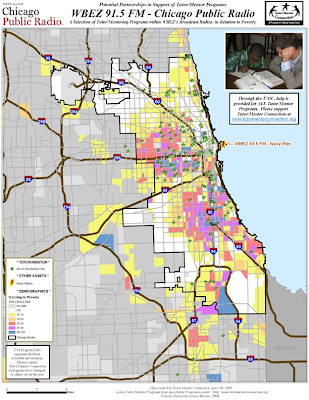 We’re illustrating how maps can be used by business, religious, political and education leaders to mobilize resources that make constantly improving, volunteer-based tutor/mentor programs available to more of the children living in high poverty neighborhoods of the Chicago region. We’re demonstrating how leaders in other communities can use maps for the same purpose. Please take a look at the new Program Locator and build your own understanding. Then please let us know what you think. We want to know from you how you are using this tool. We also want to know what might work better. Since we’re a non profit and have built this service with the help of volunteers and a few donors, we’re also looking for other people who will provide money needed to manage this service, and make the improvements that many of you will want as you begin to use the site. Again, please post your comments below. And thank you for supporting tutoring and mentoring programs in Chicago!